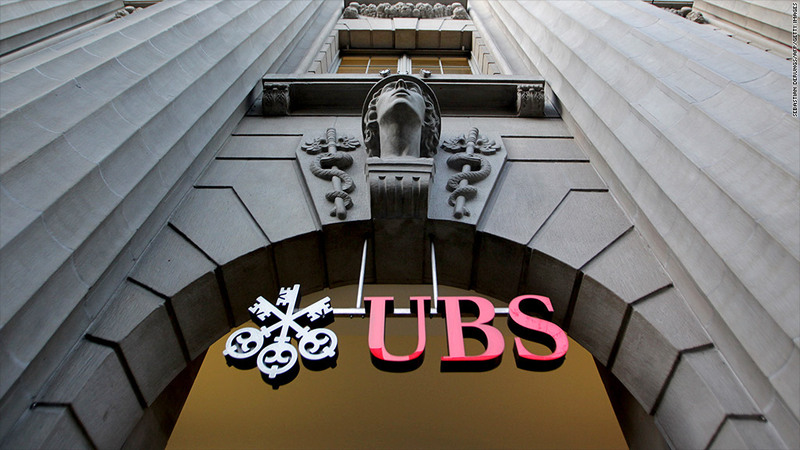 Restructuring at Swiss bank UBS may be beginning to bear fruit. Shares in two of Europe's biggest banks surged Tuesday as investors saw signs that the sector may be on the road to recovery. The banking industry has been grappling with the fallout of the financial crisis for years, working through bad loans, various legal scandals and increased regulation. Shares in UBS (UBS) shot up by as much as 7% after the Swiss bank reported "strong results across all its businesses," with wealth management performing particularly well. The bank recorded a profit of 988 million Swiss francs, or $1.1 billion. This followed a massive fourth-quarter loss, due partly to the $1.5 billion cost of settling Libor manipulation charges. The bank has been restructuring its operations, including cutting 10,000 jobs around the world. Deutsche Bank (DB) shares also gained up to 8% as investors cheered the bank's decision to issue new shares in an effort to strengthen its capital base. Germany's biggest bank issued nearly 3 billion euros, or $3.9 billion, in new shares. The sale to institutional investors addressed criticism that the bank's capital base was thin compared to its peers, leaving it more vulnerable to future shocks. Deutsche Bank also reported higher revenue and profits in the first quarter. The bank reported a 2% rise in revenue and net income of 1.7 billion euros, up from 1.4 billion euros in the first quarter of 2012.